CARBONDALE, Ill. -- Southern Illinois University Carbondale alumni, students, parents, faculty, staff and community members can “Open The Door to Opportunity” by participating in a unique fundraising campaign on March 1-2. The inaugural SIU Day of Giving is a 24-hour fundraising campaign that will invite donors to directly support an area on campus that is meaningful to them and ensure that each gift, regardless of the amount, will impact students’ lives. The concentrated online campaign is from 6 a.m., March 1, through 5:59 a.m., March 2. Information about SIU Day of Giving is available at siuday.siu.edu. 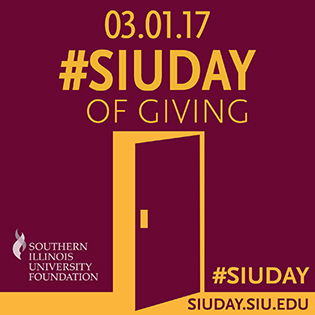 While the bulk of contributions are expected to be made online, donations can also be made that day by phone at 618/453-4900, or by mail and indicating that the gift is for #SIUDAY. The goal of the university-wide event, in addition to raising funds, is to build awareness of the importance of philanthropy to SIU’s success, said James Salmo, vice chancellor for development and alumni relations and CEO of the SIU Foundation. Salmo said philanthropy and private support help fund program enhancements, hands-on learning opportunities for students, and scholarships. “These are the things that private dollars can do and it makes a difference,” he said. Donors will see their funds make an “immediate, quick impact” into the designated area donors select, Salmo said. The separate areas donors can choose from include each of the university’s eight colleges, the Graduate School, School of Law and School of Medicine. Other units on campus include Saluki Athletics, the SIU Alumni Association, Morris Library, Paul Simon Public Policy Institute, Student Affairs, Touch of Nature Environmental Center, University Honors, and WSIU Public Broadcasting, and there are areas for the campus lake beautification project, diversity initiatives and performing arts. Each section has a list and brief explanation for each of the different projects. There are also areas for challenge and matching gifts. The campus lake beautification project is one that Salmo believes many potential donors will identify with. More than 70,000 people walk around the lake annually, and the lake is considered by many to be a crown jewel of the campus, Salmo said. Students and alumni are excited about plans that were announced in December to upgrade the lake’s boathouse thanks to an alumnus’ donation. Among possible lake improvement projects are fountain installations that will serve as a natural aerator, trees to give harbor to fish and provide research opportunities, rest areas, fishing docks, picnic areas and benches. Plans are to hold future SIU Carbondale Day of Giving drives each March in honor of the university’s founding on March 9, Salmo said. Organizations nationwide have found that one-day fundraising events can be the impetus for first-time, and then subsequent donations, according to Salmo. Students will also be involved on March 1 as ambassadors at various locations on campus including the Student Center and Morris Library. Students will share in the day’s events, fundraising progress, and messaging on social platforms including Facebook, Twitter and LinkedIn. For more information, contact Rebecca Renshaw, associate director of communications, SIU Foundation, at 618/453-1328 or rebeccar@foundation@siu.edu.